In which Claire, who doesn’t speak french, bakes her way through the cake section of a french cookbook from 1962. Oh, how we laughed as we made this cake! We gathered in my immaculate kitchen, my perfectly obedient boys danced around me, singing songs about raspberries and strawberries in fluent french. Every stage of the process went perfectly, and we smiled as we popped the cake in the oven! We certainly didn’t curse the fact that we know french much less well than we thought. We certainly didn’t swear at google translate for making absurd suggestions as to the translations of french words. We didn’t frown anxiously as Malcolm said, “are you sure that’s the right amount?” We didn’t get called away from the dough at a critical moment, and leave it in Malcolm’s capable but unpredictable hands. We didn’t hear him say, “Ooh, t’s like play-doh!” as we left the room, and we didn’t think about the fact that when Malcolm plays with play-doh I generally have to peel it off the ceiling. We didn’t let it rest for an hour and then find a lump of stodgy dough with bits of dried yeast clinging to it. We didn’t add lots of other ingredients that didn’t mix in, only to find ourselves up to our elbows in a a sludgy mess. Certainly not! I let Malcolm choose which cake to make by opening to a page in the book, and seeing which name he liked best. He chose the gateau savarin. 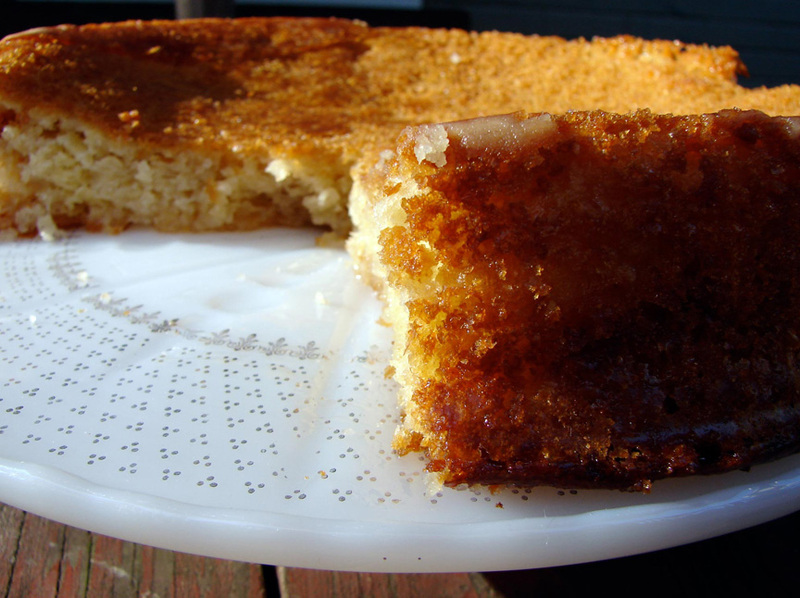 It’s a yeasted cake with very little sugar, and then you pour a sugary, alcohol-laden syrup over, which soaks in and sweetens and flavors the whole thing. Kind of like a rum baba, really! If I was being perfectly honest, I would tell you that I had some trouble with this one. (Spoiler alert, it turned out very good in the end, and it was worth all the trouble, and I’m glad I didn’t give up half way through and throw the dough against the wall and stomp out of the house in a terrible temper, which, of course, I wasn’t tempted to do at all.) I have diagnosed my problem, and I think it’s because the yeast I used is the little packets of yeast granules, and I have no earthly idea what kind of yeast the recipe called for, but it certainly wasn’t the kind I used! My food processor saved the day, and with its noble help, I was able to pull everything together in the end. I’m going to give you instructions to make this the way I would make it with packets of yeast. It should all go smoothly from there. It’s supposed to be made in a ring-shaped mold, but I don’t have one, so I used a regular cake pan. Apparently you can use rum, kirsch or curacoa. I’d like to have used kirsch, but I don’t have any, so I used a bit of rum, a bit of cassis. Dissolve the yeast in the milk, with a pinch of sugar. Leave for a few minutes to get bubbly. Meanwhile, in a large bowl, combine the flour, salt, sugar and crushed almonds. Make a well in the center and add the butter, eggs, vanilla, and milky yeast. Mix well, with a spoon, your hands, or in a food processor, till all of the different elements are combined and you have a nice, smooth dough. Leave it in a warm place to double in bulk. Butter and flour a cake pan (ring-shaped if you have it) and pour the batter in. It should fill it about 3/4. Leave for about an hour till the dough comes up to the top of the cake pan. …in a small saucepan. Bring to a boil, and cook for about half an hour, till it’s reduced by about half, and it coats the spoon and the pan. Take it off the heat and pour about 1/2 cup of the liquor/liqueur of your choice in. Be careful, it will bubble up! Let it cool and serve. It’s quite a simple flavor, so it would be nice with fresh fruit and whipped cream. This entry was posted in cake, dessert, Uncategorized and tagged baba au rhum, french cake, gateau savarin by Claire. Bookmark the permalink. your cooking experiences make me laugh. I’m not brave enough to try yeast based recipes let alone ones in another language! One of your best posts yet! Trying to work out how much fried yeast when the recipe says fresh is always a pain. I’ve discovered that in England, if you have a supermarket with a bakery inside, they will often give you fresh yeast if you ask nicely. Forgot to click the follow-up. Dash! I posted a reply earlier and it disappeared! The thing that I feel foolish about is that I didn’t even think that it might be a different kind of yeast. If I’d taken a minute to think it over I would have realized, but I was so happy to figure out that “levure” yeast, I didn’t think beyond that! I’ve never worked with fresh yeast, but I’ll see if I can find some. Oops, fried yeast. Meant dried of course. Must put contact lenses in! videos that showcase what you sell, you can reach a wide range of customers you would not normally be able to access.